Performers include: Rasmus Hardiker, David Menkin, Thomas Brodie-Sangster, Angel Coulby, Kayvan Novak, Rosamund Pike, David Graham, Sandra Dickinson, Andres Williams, Chris Jarman, Adjoa Andoh, Teresa Gallagher, Rhys Darby, Jack Whitehall, and Taj Atwal. A remake of the 1960 television series, the Thunderbirds Are Go! TV show is a futuristic animated British-Australasian sci-fi series. The action centers on the secret organization, International Rescue. International Rescue has its headquarters on Tracy Island, a hidden base in the South Pacific. While the team members’ identities aren’t the stuff of general knowledge, their heroism is. Even the sneaky strategies of “The Hood,” an enigmatic international criminal, are no match for their courage and drive. The hi-tech organization operates rescue missions everywhere — land, air, sea, and even space. The Tracy brothers man International Rescue’s different Thunderbird crafts. First Responder and Team leader, Scott Tracy (Hardiker) helms Thunderbird 1, a first-response rocket-plane. Virgil Tracy (Menkin) serves as the Demolition, Heavy Lifting, and Logistics expert, and pilots Thunderbird 2, an auxiliary equipment transport. Thunderbird 3 is a space rescue rocket captained by Astronaut Alan Tracy (Hardiker). Patrolling the underwater search and rescue beat is Aquanaut Gordon Tracy (Menkin), on Thunderbird 4, his mini-submarine. Rounding out the fleet is Thunderbird 5, a communications and logistics satellite hub, which operates under the watchful eye of Space Command Communicator and Dispatcher John Tracy (Brodie-Sangster). Supporting the team are mechanical genius Hiram, aka Brains (Novak), stealth operative Tanusha “Kayo” Kyrano (Coulby), and agents Lady Penelope Creighton-Ward (Pike) and Aloysius Parker (Graham), her driver. 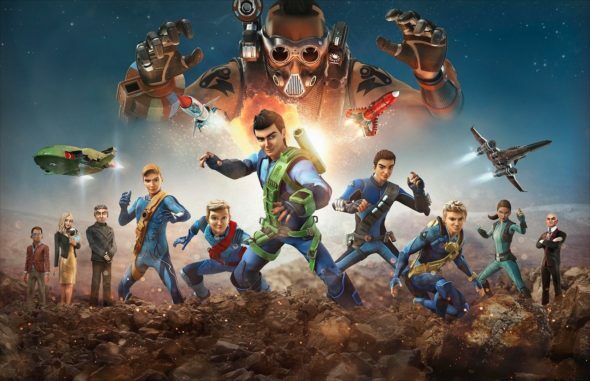 From from the depths of the oceans to the highest reaches of space – when others need help, Thunderbirds Are Go! What do you think? Do you like the Thunderbirds Are Go! TV show? Do you think it should be cancelled or renewed for another season? Please do NOT cancel Thunderbirds Are Go! My grandsons, my husband & myself are “addicted” to this show! Season 5? Agree, keep it going…more, more more!!!! Keep Thunderbirds going! It rocks!!! When’s the new season going to be released? Is there any possibility they will shoot additional episodes in the future? TAG is not British/Australasian but British/New Zealand. I don’t think the Aussies have a hand in this one..
ITV Studios are from the UK in London Borough of Lambeth. Pukeko Pictures & Weta Workshop are Kiwi from Wellington, NZ.